If the first two acts of Terranigma were an ode to creation and nature, the massive third act is a requiem of history and humanity, a dark assemblage of surprisingly tragic events for a 16-bit game that goes beyond the normal RPG tropes. This is the second part of my Terranigma retrospective, focusing more on the plot elements that make this the greatest SNES RPG no one played with spoilers as this is delving into a whole lot of specifics. I used to be terrified of Bloody Mary. Still am. In elementary school, kids would ask, have you done this and that to evoke Bloody Mary? I get chills just writing about it. So it was a bit of childhood exorcism to take on Bloody Mary, who also happens to be one of the toughest bosses in Terranigma. Her castle has the creepiest paintings I've seen in a SNES era game with all the portraits missing their eyes. First time I fought her, my hits had 1-3 damage on her compared to the usual 30-40 on other bosses. The most disturbing part of the battle was learning how the death of her three children drove her into madness. Well, that, and the fight against a quartet of dolls chiming taunts while circling around you, impervious to attack. One of the more light-hearted moments in the game is an actual visit to Quintet, the developers of the game in Neo-Tokio. They jokingly refer to Terranigma as Illusion of Gaia 2 and hint at the ungodly amount of hours that went into the development. It goes to show, despite all the progresses in technology and efficiency, it stills takes lots of hours to make something good. Creation is hard. The world feels vast and I was so happy it wasn't interrupted every 5 seconds or so by a jarring sound effect followed by a random battle. You traverse the continents, explore a myriad of locations, and enjoy the grand overworld theme without continual conflict. This also begs the question, whoever thought countless random battles was a good idea in the first place? One of the most fascinating aspects of the game is the town-building. While not on the level of another Quintet classic, ActRaiser, you interact with a series of 16-bit geniuses including those inspired by the painter Matisse, Thomas Edison, and Alexander Bell as you help your civilization grow. Much of it revolves around the mechanic of bartering items between different cities. You feel the repercussions of your interactions playing cultural ambassador who's also trying to help increase the Economic Growth Index of each town. Slowly, villages become actual cities as you spread fancy brand name clothes and fastfood hamburgers. You even help tourism by snapping photos of exotic locations. Pretty soon, you'll be taking corporate sponsors for your swords and get advertising deals for your greatest boss fights collected into DVD anthologies that'll get sold in the sales binge on Black Friday for $1.00. Silent Hill 2 was probably one of the best games on the PS2. What anchored the whole game was Sunderland's undying devotion for his deceased wife. I was reminded of my excursion to Silent Hill when I met Servas who was waiting for his fiance, Nana, at the beginning of the Great Lake Caverns. I presumed somehow, I'd rescue her and help the separated couple get together again. But after defeating the monsters who've infested Mermaid Tower, you meet Nana and learn she actually died at sea in a storm. She's been reborn as a mermaid and asks you to give her ring to her fiance, pretty much stating they can only be together after he dies. When you return the ring to Servas, he thanks you and vanishes into thin air. I wondered, what happened to Servas? Are they together now? Is it possible there's some other mysterious power running the whole show like the UFOs in Silent Hill. Wait, who's Beruga? Wait, who's the main villain? Are Zombies immortal? That's what mad genius Beruga seems to think. And in the zombie ruins of Louran, you take on an Army of Darkness, only without a chainsaw. The more you find out about Louran, the more you discover how they were responsible for their own destruction. Their only saving grace is Meilin, a mysterious girl who has the power to recreate illusions. Not just of gaia, but love, the past, and even entire cities. Terranigma has many illusions, but its story isn't one of them. Unflinchingly honest, at times, brutal and dark, it's the kind of gripping storytelling that's reserved for the best of narratives. The world is almost about to be reborn, but not in the way anyone could imagine. I know now why so many people who recommended Terranigma to me had a hard time describing it. It defies pat summaries. It's not just about a hero saving the world, as in many ways, your initial mission turns out to be the complete opposite until you change your course. But it's also about more than just a life simulator. The developers specifically wanted to focus on spurring the imagination of gamers in regards to the effects their actions have on the world. Terranigma's brilliant enigma is the way it successfully incorporates the complexities of life into one package in the coat of an anime-styled 16-bit JRPG. 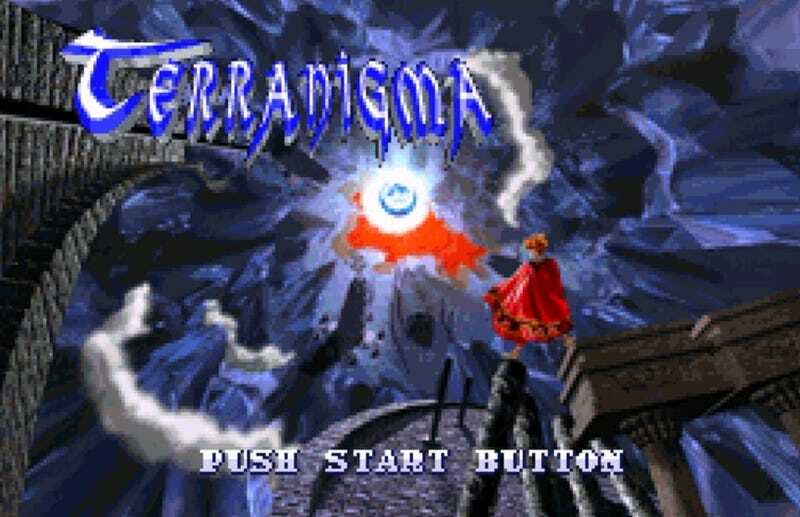 Updating 4/3/2015 with the Conclusion to the Terranigma Retrospective. Peter Tieryas likes enigmas and rambles randomly about Edison, Bell, and Matisse at tieryas.wordpress.com.